This is another special recipe from my “favorites” category. 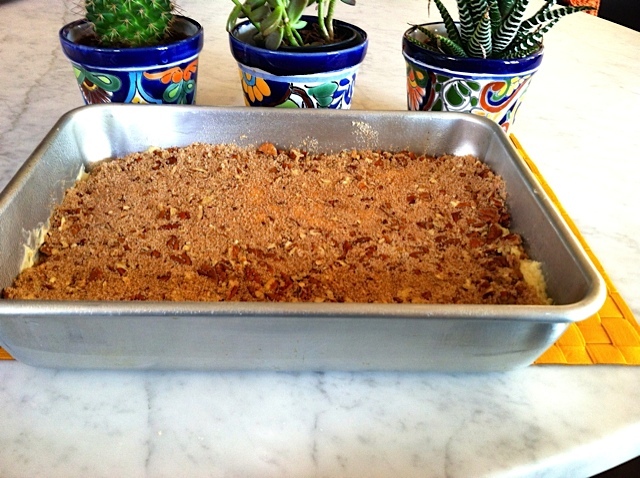 This old fashioned, rich coffee cake frequently appears for brunch or breakfast celebrations at my home, and when it bakes in the oven the entire house smells like butter and vanilla. 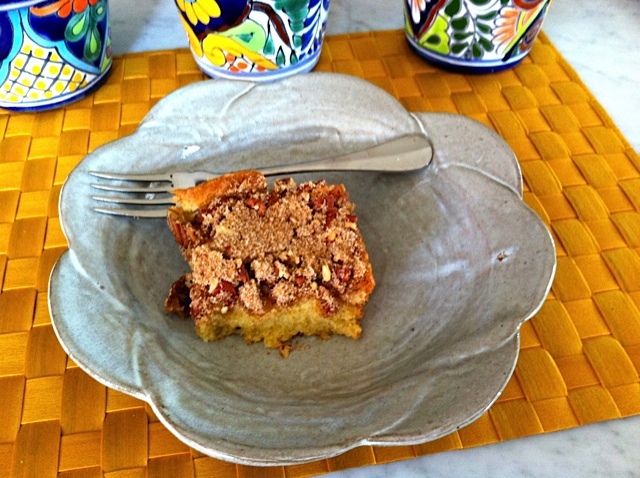 I’ve had numerous requests for this particular coffee cake over the years. Nothing could be easier or as foolproof as this formula! The next time you have company for brunch, serve this with coffee or tea. It makes a large cake pan full and I often freeze half of it. Just a sliver of this perfectly balanced cake satisfies anyone’s sweet tooth… I’ve even been known to serve this for dessert following dinner! Have all ingredients at room temperature. Position a rack in the middle of your oven and preheat to 350 degrees. Grease with butter and flour the bottom and sides of a 9 x 12 cake pan and set aside. Combine flour, soda and salt and stir well and put aside. Cream butter and sugar for four minutes, then add eggs one at a time until well blended. Add vanilla and then the sour cream, making sure it is incorporated. Quickly add the flour mixture in two batches and mix until combined. Put batter in the cake pan, evening out the top. The raw mixture is thick and can be a bit difficult to spread. Combine topping ingredients, mix thoroughly and evenly sprinkle on top of the cake. Press down lightly with the palms of your hands all over the top so the sugar-nut mixture doesn’t come off. Bake for 30+ minutes. BE SURE IT IS DONE by testing with a toothpick. Remove to a rack and cool completely. Covered, this stays moist at room temperature for 4-5 days or can be frozen for up to two months. This entry was posted in Breads, Breakfast and tagged Coffee Cake. Bookmark the permalink. Don’t know if you got my reply since I was in Pt. Angelas..but of course it works in a bundt. I do put half the filling in the middle of the cake, top with the other half of the thick batter then the rest of the topping. Press the topping into the dough on top (a lot will fall off at the end) and bake. Be sure it is done because it is very dense. Soon, soon you’ll be busy as Grandma!